When your check engine light comes on, it’s a sign that there’s something wrong in the tuning of your engine, but it’s still a long way from a diagnosis. There are literally hundreds of triggers that could cause your Check Engine light to come on, and each of those triggers may be due to a dozen or more different repairs. You need an experienced and highly trained technician to track down the cause. The technicians at AAMCO Transmission and Automotive Repair of Plano are among the best-trained in the industry and we have some of the most sophisticated diagnostic tools available to track down the exact cause. (972) 633-1590 FREE or schedule your appointment online to get this checked out before you are facing a more serious maintenance issue. What Is the CHECK ENGINE or SERVICE ENGINE SOON Light? Modern vehicles are engineered to run with a very precise tune to ensure maximum fuel efficiency and minimum emissions. When your car’s onboard computer senses that your car is no longer running within this tune, your Check Engine light will come on. 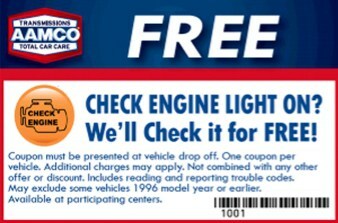 When you come into our shop with your Check Engine light lit, we will do a FREE check to figure out what tripped the light to come on. This means that we will hook your car up to our computer and figure out what the car’s computer has identified as a problem. This is a great starting place, and we can often give you some idea about what might be the cause and how much it might cost to repair, but to determine the actual cause typically involves a more extensive diagnostic, which is generally not free. System running too lean—may case a hesitation/surge during acceleration or spark-knock in the engine. 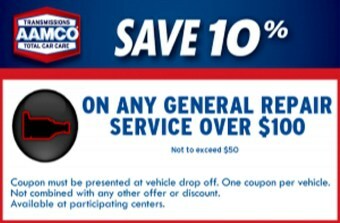 As we said above, there are literally thousands of possible repairs that may be necessary to fix a Check Engine light problem. 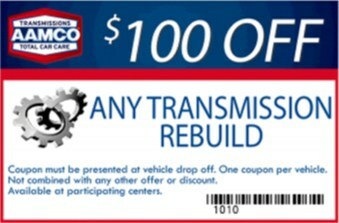 When you bring your car to the skilled technicians at AAMCO Transmission and Automotive Repair of Plano, you can be sure that we will work hard to track down and fix the right cause. To get your problem identified as accurately as possible, please schedule an appointment online soon.